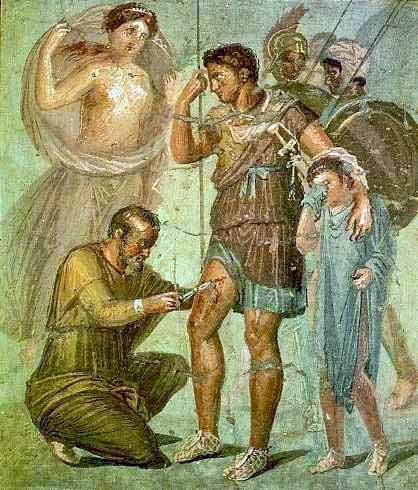 understanding of human anatomy, none had the benefit of antibiotics or anesthesia. Humans have been suffering traumatic injuries from the beginning of the species. For most of history, if we exclude deaths and injuries sustained on the battlefield, these injuries tended to be infrequent, isolated incidents. Often they were fatal, and since for the most part they happened in single numbers, there was little thought given to how to prevent them. The pattern of injuries, like virtually every other aspect of society, was turned on its head when the Industrial Revolution arrived. Suddenly large working forces were put in close contact with unforgiving machinery, where a momentary lapse in coordination or attention could result in horrific injury. Every mechanized industry involved a high amount of danger for its employees, but the odds were worst for the railroad workers, who had to compete with momentum and natural elements in addition to the hazards of heavy machinery. The result of this was that traumatic injuries began to occur on a previously unimaginable scale, as detailed in the previous article. While the railroad companies’ parsimonious approach to worker safety inexcusably increased the number of employee deaths and injuries, they weren’t entirely complicit in their response to the situation. 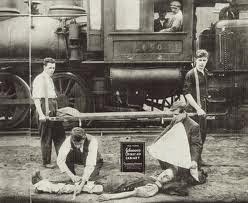 As the high number of injuries began to take a toll on the work force, many companies began to contract with doctors serving the towns built up along the railroad track and then, when their services were insufficient to handle the high numbers of casualties, began to hire doctors directly to treat yard and crew members when they sustained injuries on the job. The darker side of their work, thus, forced the railroads to become on of the first industry to offer health care as a benefit of employment, as well as one of the first to extend benefits to the survivors of a person killed on the job. Because their patients were almost entirely composed of individuals who had suffered traumatic injuries, these “railroad surgeons,” as they were called, became one of the first medical specializations, roughly akin to today’s trauma surgeons. The surgeons did not, however, have the benefit of the sterile tools, medications, and specially designed trauma bays and operating rooms that those who visit or work in modern emergency rooms take for granted today. The first generations of railroad surgeons had to treat such complex injuries as amputations, compound fractures, and serious internal bleeds with primitive medical tools, a dearth of antibiotics, and no practical way of anesthetizing a patient. Frequently, they had no medical facilities of their own, and attempted the messy work of saving a patient’s life from within a rented hotel room. This era, too, was without ambulances or any other sort of infrastructure designed to quickly transport an injured person to medical help, and the fact that injuries to railroad workers often happened hours or even days away from proper medical care complicated the seriousness of their wounds. Many people who might have survived their initial wounds were forced past the point of viability as bystanders failed to stop the bleeding of their wounds, or the bumping and jolting of the train ride taking them towards a doctor compounded their wounds. Others contracted a fatal infection after other crew members attempted to bind their wounds with the only materials available to them--dirty rags used for cleaning and polishing other parts of the train. The retention of railroad surgeries notwithstanding, the risk of injury and death followed railroad employees anywhere their trains traveled. The companies employing them were soon inspired to additional action. 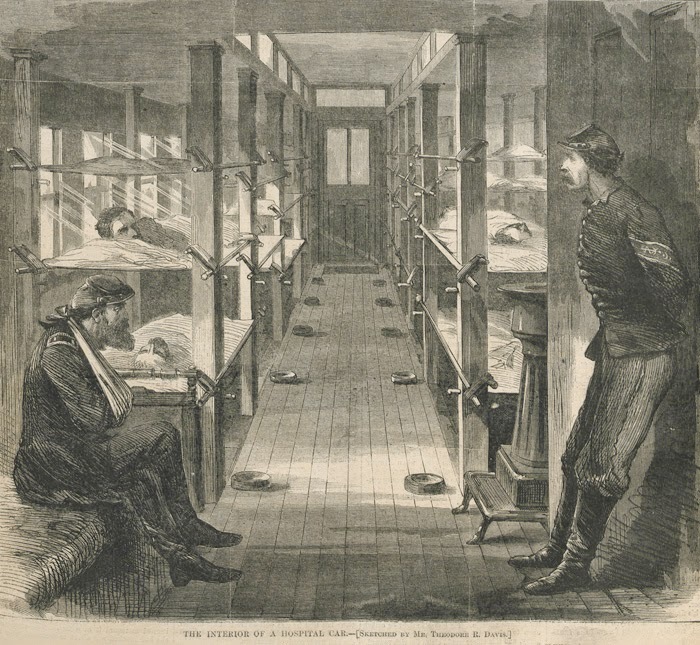 It was not practical to assign a doctor to every train and switching yard in service, as an army would be accompanied by a medical detachment. It quickly became clear that in order for employee fatalities to be substantially reduced, two things must happen. First, there must be common knowledge of how to assist the injured person in the time between the injury was sustained and he reached a doctor, and second, that a certain amount of medical equipment to accompany this care had to be standardized, and shrunk down to a portable size. In other words, there was clear need for both first aid procedures and the first aid kit to be invented and distributed. Today, both of these things are so commonplace and mundane that it’s hard to envision that they ever had any point of invention. Most workplaces put up posters describing such life-saving interventions as the Heimlich maneuver and CPR, and first aid kits are streamlined enough that I can carry (and occasionally use) one at all times inside of my purse. A hundred and fifty year prior, however, the idea that bystanders could intercede and remedy a serious injury was revolutionary and difficult for members of the public to take seriously. The idea might never have taken off, were it not for one of those chance meetings that ends up significantly changing the course of history. One day in 1880, a railroad surgeon riding as a passenger on a Denver & Rio Grand train struck up a conversation with a fellow passenger. Perhaps fatigued after a long and grueling day, he spent an ample portion of the talk complaining about how his job was made all the more difficult by the lack of reliable supplies and standardized procedures. As it happened, the man who had his ear was none other than Robert Wood Johnson, of the still-prolific Johnson & Johnson company. 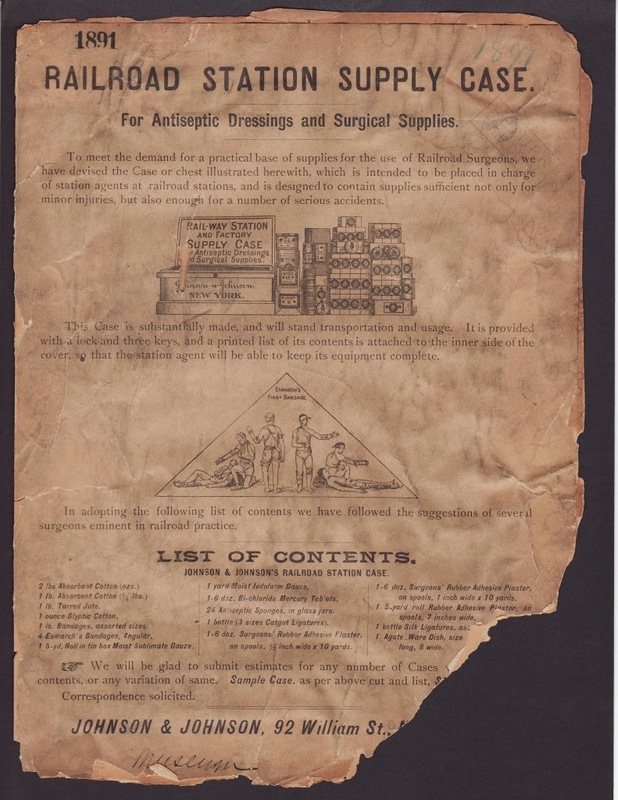 Quickly recognizing a niche ripe for development, in the following years Johnson took it upon himself to contact railroad surgeons across the country and compile their input about what sort of supplies they considered essential. In 1890 Johnson & Johnson released the Railway Station and Factory Supply Case--one of the first examples of a portable, sterile, and commercially produced first aid kit. They also produced standardized cases of tools and supplies designed for the surgeons’ use, and a few years later published the first manual of first aid procedures. Demand for these products quickly blossomed beyond industrial settings. The railroad infrastructure also led to vast changes in the way that injured patients were transported. By the 1870s, after the American Civil war and the Crimean War in Europe, it became readily apparent that railroads were key in transporting troops to the location of the battlefield. Less dramatically, but just as critically, was their role in transporting the large numbers of injured soldiers away from the front lines. Medical personnel and railroad managers colluded to turn boxcars stuffed with cots and hammocks into mobile hospitals, quite capable of treating serious injuries while on the move. The concept became more frequently employed to serve the needs of injured railroad workers, was used with great frequency during both world wars, and influenced the design of modern ambulances and medevac helicopters. 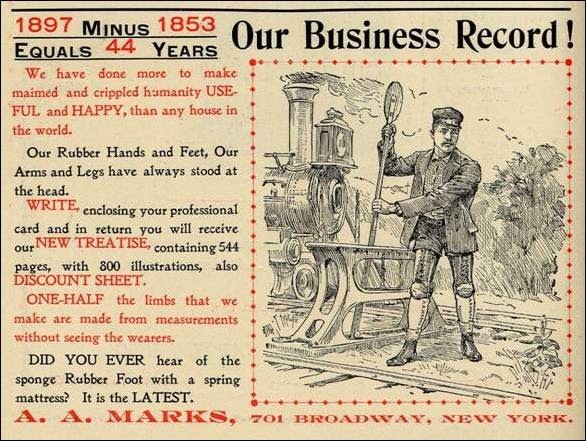 In conclusion, the coming of the railroads brought with it a high cost in human injury and life. The response of the company owners and the medical industry, however, was not static. Their response to the sheer numbers of injuries and attempt to provide trauma care were critical to the development of modern emergency medicine.